an unsought-for but unexpectedly perfect book. This summer I've been reading books from 1914, as well as a few written about that momentous year, so when I was at the library last week and spotted this book on the display shelf it felt serendipitous. Bookish serendipity at its best. 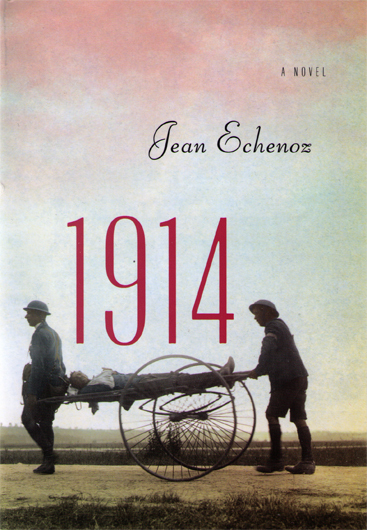 This novel, written by French author, Jean Echenoz, is only 109 pages long and begins in France on the first day of World War I. Charles and Anthime Seze, two brothers in love with the same girl, are quickly mobilized. Charles is positive the war won't last long; Anthime is not so sure. Echenoz paints perfect snapshot moments of what follows next for these brothers: in the air, on the ground, and in the trenches. There's mud, gas, shrapnel, and death; there's also survival, life, and hope. I love how Echenoz was able to show so much with so few words. This is a quiet and beautifully written novel. I'm so glad I stumbled on it so serendipitously. I love bookish serendipity! And I have been meaning to read more about the Great War, as the centennial gets closer. This was a quick read and gives you a taste of what the war was like. It's always lovely when you unexpectedy find a brilliant book :) Great review! How perfect! I love finding a book that I didn't know I needed! I'm glad you enjoyed 1914. Thanks! It was a happy accident.